It is not unusual that Human Rights Organizations slam the armed groups in Syria for recruiting Syrian minors to fight in their lines. 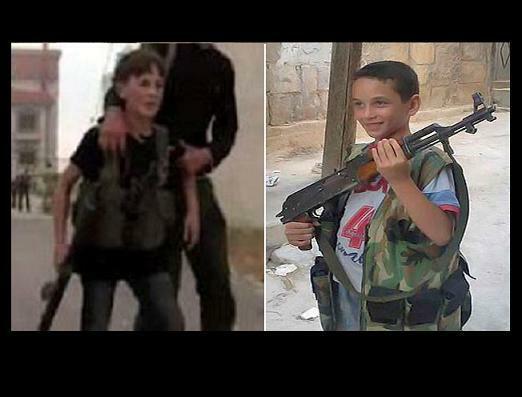 Hundreds of videos and images broadcasted on YouTube reveal that these children fight in the front lines in Syria. This phenomenon was greatly conspicuous in some Syrian countryside, especially Edlib and Aleppo’s countryside. Moreover, Syrian official authorities reiterated that there are no accurate statistics of the number of recruited children due to the difficulty of reaching them in battle areas. Furthermore, she added that the Syrian Committee of Family Affairs pursuits this phenomenon suspiciously spread in Syria through launching TV awareness campaigns warning of the dangers of recruiting children. It is also putting together a work plan with the National Conciliation Ministry in the Syrian People’s Assembly in light of the Committee’s inability to reach these groups except by mediums, primarily aiming at providing the suitable treatment for them. “This phenomenon changes the child into an unstable human being,” she further stressed. “Recruiting children is a form of human and minor trafficking,” he added. “Our society never witnessed such a phenomenon and unfortunately, the idea of murder has been engraved in the child’s mind, where he would see in murder and violence the ability to achieve his interests,” he added. “We warn of the catastrophic results of such phenomena in case the crisis in Syria ends, since violence will be engraved in the child’s mentality, which could drive him to murder as well as social and psychological disorders,” Rahmeh stated. “The Syrian community suffers a financial pickle currently, which drives some to exploit this fact,” he stressed. “No man would sell himself unless he reached severe poverty, and this is what happened in the popular environment in some provinces, such as Edlib countryside, where 36% work in agriculture and the other third work in social services,” Rahmeh stated.